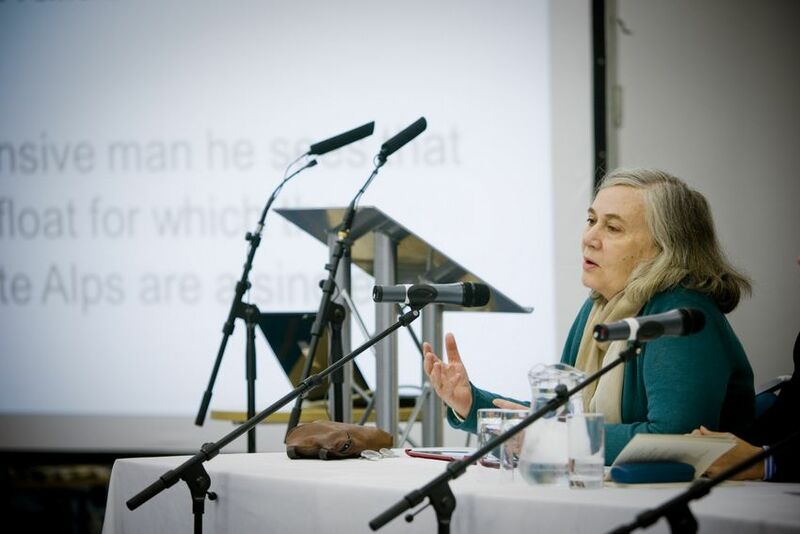 The Penny Readings Festival 2013: A very Readerly Christmas! 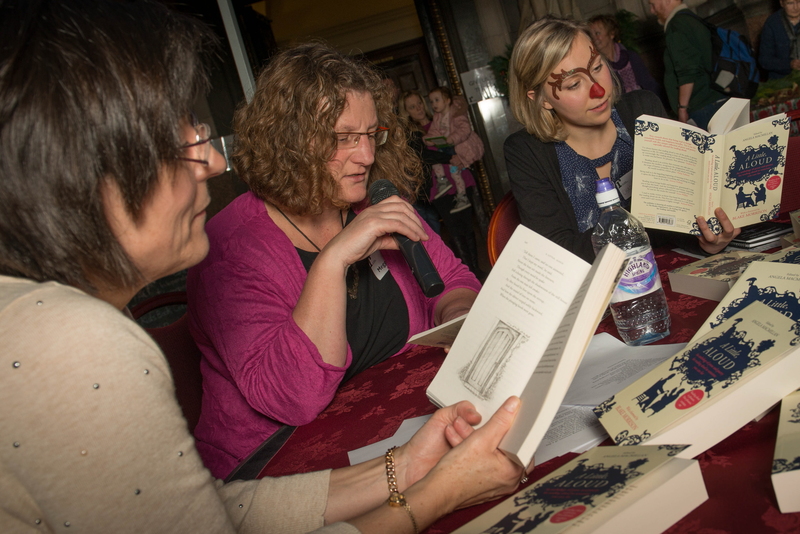 A Readerly Christmas came to St George’s Hall on Sunday with The Reader Organisation’s very first Penny Readings Festival! 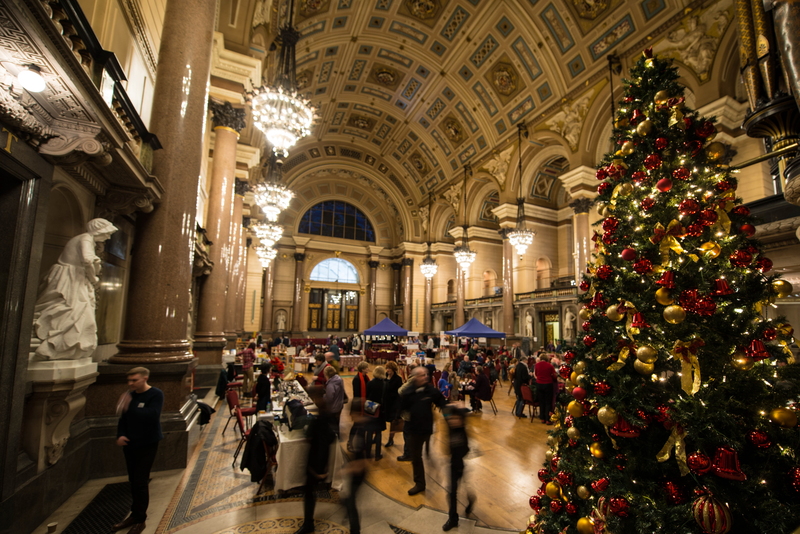 To celebrate 10 years of our annual festive extravaganza, we opened up the Great Hall to the public for a whole afternoon’s worth of free festive fun that began the season in style. Our staff, volunteers from our Big Lottery project and stallholders offering an array of Christmas delights provided tons of seasonal activity and plenty of Christmas cheer to the crowds in anticipation of two sold out shows, the Hapenny and Penny Readings. 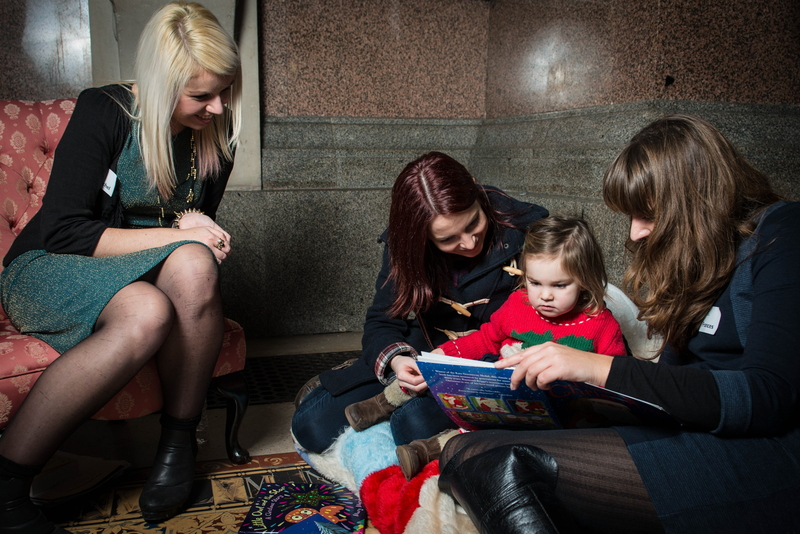 Amongst the festive fun there was plenty of reading, with Christmas themed poems being read aloud in the grand surroundings, fun festive stories for children as well as puppet making and crafts, and the chance to learn some shared reading skills. Festival goers pledged to Give Us 5 for Reading with the start of our new initiative to get Liverpool reading in 2014, as we opened up our video booth to let people share their favourite stories and poems with us. There was also a very busy Christmas cafe and Christmas presents galore with beautiful jewellery, art and craft, tons of books from TRO and News from Nowhere on sale, and a seasonal selection of cakes from Just For Kids Cakes – who also provided a specially made Christmassy cake as the star prize in the Festival raffle, drawn by Santa himself. TRO’s very own Patrick Fisher took the lead as MC for the afternoon and continued to impress when he and his comedy group, Sticky Floor took to the stage for ten minutes of improvised comedy – a clear favourite with both the children and adults! Readings were performed by Dave Cookson and Anna Fleming, two of The Reader Organisation’s Young People’s Project Workers, The High Sheriff of Merseyside reading Mr Toad, and Charlie Coyne reading an array of classics including William Blake’s Tyger. On top of this, 11 very brave children from Caldies Creatives, our Saturday morning group at Calderstones, took to the stage to read one of their favourite poems, Christmas Pudding by Charles Thomson. Festive music came from Grace Farrington on the trumpet and young, talented musician Lewis who wowed with his violin skills when he played White Christmas and The Christmas Song. The final act Take A Hint Theatre Company received a wonderful response from the audience when they performed extracts from their innovative play, Tales that Time Forgot, which powerfully reminded us all how fantastic and important reading is. The afternoon was then topped off by a visit from a very special guest… Father Christmas, who kindly brought with him a brand new book for every child in the audience! The Penny Readings wowed again this year with the return of last year’s showstoppers the Wirral Ukulele Orchestra. Frank Cottrell Boyce also made a reappearance with a reading he’d written just mere moments before he was due to take the stage, leaving the audience in fits of giggles. Another act to tap into the audience’s funny bone was comedic group Sticky Floor with their impromptu comedy. Newcomer to The Reader Organisation Valetin Gerlier showed off his guitar and song writing skills whilst dance company RuShee got everybody dancing with their Bollywood Dhamaka. The Penny Readings also saw lovely readings from Angela Macmillan who read an extract from Nicholas Nickleby, Louise Jones and Marion Worth (two of The Reader Organisation’s Big Lottery Volunteers) read two poems and local poet Paul Farley read his own work. As usual Phil Davis ended the night with an extract from A Christmas Carol and Wirral Ukulele Orchestra joined with the sensational i Choir led us out to a lovely rendition of ‘Lean on Me’. Had a wonderful evening at the #PennyReadings! A truly inspirational night of joy and Christmas cheer! Dickens would be proud! Fantastic entertaining evening at the Penny Readings, I’d forgotten what a pleasure it is to be read to! First time in #Liverpool for #pennyreadingsfestival @thereaderorg. Liverpool, I’m in love. Philip Davis FTW! A huge thank you to all of our guests, performers, volunteers, our sponsors Publiship and Liverpool Learning Partnership and the audiences themselves for enjoying the extravganza with us. Here’s to next year! Author LisaPosted on 17th December 2013 16th February 2017 Categories Authors, Books, Children's Literature, Christmas Reading, Classics, Events, Fiction, In the Spotlight, Liverpool, Merseyside, Penny Readings, Poetry, Reading for pleasure, Schools & Young People, The Reader, Theatre, UncategorisedTags arts, Big Lottery, Charles Dickens, Christmas, Frank Cottrell Boyce, i Choir, Liverpool, Paul Farley, Penny Readings, St George's Hall, The Penny Readings Festival, The Wirral Ukulele Orchestra2 Comments on The Penny Readings Festival 2013: A very Readerly Christmas!